Today's EOS cameras allow you to experiment with black and white at no cost. Have a go with the help of this essential DVD and learn how to capture and produce stunning monochrome images. 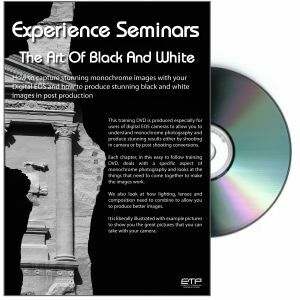 Master black-and-white photography in the digital age with this DVD from Experience Seminars. Great for visual learners, you can load the DVD into your computer or DVD player, sit back and learn. The disk is divided into chapters for bite-sized learning and easy navigation. There are several ways to produce black and white images digitally. This DVD looks at all the methods available from in-camera shooting through to RAW and JPEG capture and conversion of files in an imaging programme.